The war in Yemen is often described as a forgotten war and when/if it is remembered, it is not seen with a holistic lens recognising the full picture of the conflict – and this automatically leads to flawed conclusions. Great focus is often paid to the geopolitics of the war in Yemen, i.e how Yemen has become the proxy war between Saudi Arabia and Iran, while a lesser focus is paid to the domestic politics. The internal eco-political dynamics between the different local political and tribal actors is to a great extent the fundamental driving force of the war in Yemen. That is, the local political landscape is dominated by survival politics and checks and balances which influence the geopolitical relation between Yemen and countries involved in the conflict. More importantly, not giving a complete consideration to Yemen’s domestic politics by the international community hinders reaching any peace process for Yemen’s 2-years-long war. A good starting point could be in understanding that there have been three stages to the ongoing conflict in Yemen. In the wake of Yemen’s 2011 uprising, it was a conflict between ousted Yemeni president, Ali Abdullah Saleh and his opponents – particularly those who helped topple him. By mid-2014 it was a conflict between an alliance formed by Saleh and the rebels, the Houthis against Saleh’s successor, Yemen’s transitional president, Abd Rabbuh Mansur Hadi and his government. Then, in March 2015, Saudi Arabia declared a war against the Houthis. 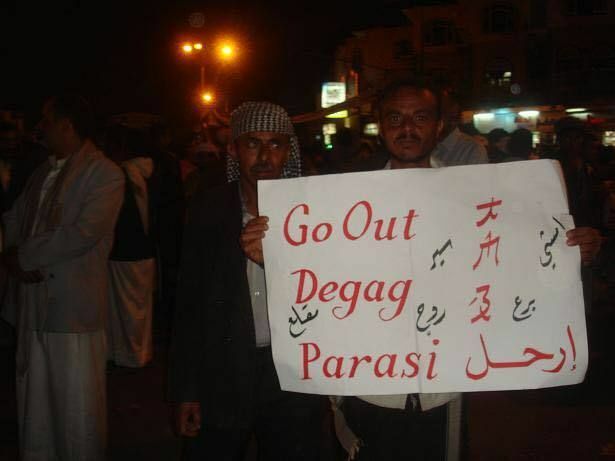 2011 – Yemen’s 2011 uprising marked its sixth anniversary this month. Photo Courtesy: Afrah Nasser. To understand the origin of the ongoing conflict in Yemen, it is essential to go back to 2011 when Yemeni youth joined the wave of revolutions happening across the Middle East and North of Africa (MENA). I vividly remember seeing how youth gradually took the streets in 2011 starting gradually from the front gate of my university, Sana’a University, which later was dubbed Taghyeer (change) square. The demand was the overthrow of ousted Yemeni president, Saleh, despite that overthrowing Saleh’s 32-years old regime was a dream my generation and I would have never imagined would come true. We understood, though, that this was the first step in fragmenting the great grip Saleh used to have. Following a couple of months of protest, Saleh’s opponents, like one of Yemen’s most influential politicians, Hamid al-Ahmar and some allies, like one of Yemen’s top army-men and actually Saleh’s half-brother, Gen. Ali Mohsen al-Ahmar – opponents and allies alike joined the uprising and worked also hard to end Saleh’s rule. The greatest blow against Saleh was when several influential tribal and political leaders switched sides in the aim of weakening Saleh’s power. Perhaps, Saleh was more upset of his allies turning tables, than the real revolution against him by his people. Consequently, Saleh’s forces intensified its crackdown on the protesters and killing has become the norm. To cease the bloodshed, the Gulf Cooperation Council (GCC) initiated a power-transfer plan in April 2011. After many long negotiations, Saleh accepted to step down. And that was the point when the unspoken countdown for the civil war which Saleh warned of began. The GCC plan guaranteed an immunity for Saleh and hundreds of his clan. What we revolutionaries saw was the biggest failure of the uprising. How can a dictatorship step down with guarantees? How do you achieve a post-uprising democratic political process, while justice was never served? In this context, Yemen had to endure a political transition without a transitional justice. The only explanation for this is that it’s absolutely impossible for the GCC to support a real democracy in Yemen, as that will be a threat to the monarchies GCC. Nevertheless, the GCC power transfer plan included the creation of a national assembly, what’s known as the “National Dialogue Conference” (NDC) (2013-2014) as a forum to settle key political problems in the country. Towards the end of the NDC, disputes appeared over the outcomes of NDC, mainly from the rebels, the Houthis. Houthis opposed the new proposed ruling system (Federalism) and they also aspired to realise their religious political vision in restoring a religious imamate in the country. In parallel, Saleh had to retaliate. Both had a mutual interest in hampering the political process and that was the seed of their coming alliance. Even though they had different motivations, the Houthis-Saleh alliance was quick in its military escalation against both Saleh’s oppositional forces and the already achieved political process. By mid-2014, Houthis descended to Sana’a, militarily took over the capital and stormed into Hadi’s presidential palace. To seek support for restoring legitimacy in Yemen, Hadi escaped to Saudi Arabia and sought an intervention. By March 2015, Saudi Arabia created a coalition consisted of 11 Arab countries and began its airstrikes campaign. 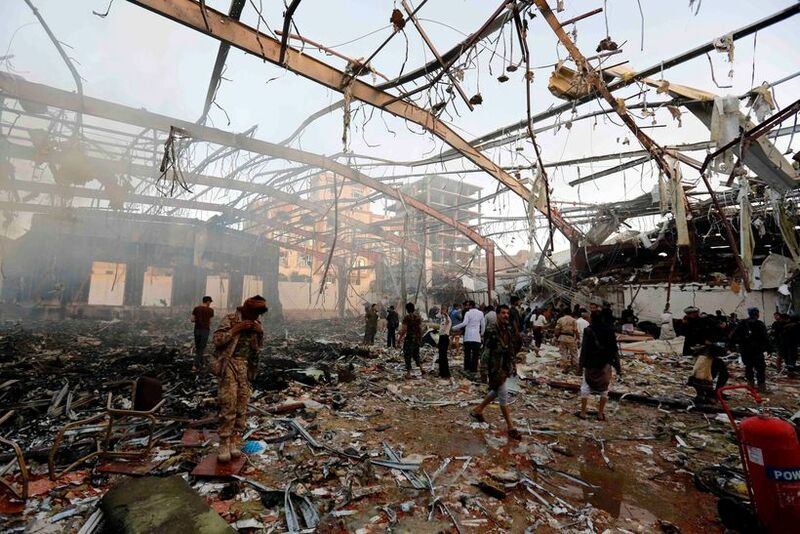 Oct, 2016 – About 1,000 people were killed and injured after a double-tap airstrike hit a funeral hall in Yemeni capital, Sana’a by the Saudi-led coalition. Photo courtesy: Osamah Abdulrhman/AFP. All these stages of the conflict have brought about one of the biggest severe humanitarian crisis in the world, with86 percent of the population in need of humanitarian assistance. At least 10,000 people have been killed, in which one in three Saudi air raids hit civilian sites; such as, hospitals, schools and weddings. The human cost of the war also means that Yemen is facing a lost generation asone child dies every 10 minutes suffering from acute severe malnutrition and lack of medical assistance. The sound of the empty roaring stomachs should be the loudest in the war in Yemen; instead, it’s the sound of guns and air-strikes. The war has been having multi-fronts: the fighting on the ground, especially in Taiz and Marib between the Saleh-Houthis’ forces and different armed factions, the fighting between the southern independence movement and Saleh-Houthis’ forces, the fighting between the Houthis’ forces and the extremist groups, i.e. AQAP and Salafists and the fighting between the Saudi forces and the Houthis at the border and the sea. Not to mention, the Saudi-led coalition airstrikes and the American drone strikes. Seemingly, Yemen is under fire on many levels. As the war gets complicated, salvation seems impossible to reach. Warring parties have failed to reach an agreement during severalpast peace talks. One reason is that, bearing in mind how the cycle of revolutions go, the counter-revolution (Saleh-Houthis’ alliance) Yemen is going through has no easy quick fix. More importantly, in light of the war, Yemen has become a great market for weapons deals and mercenaries trade. Countries like the UK, US, Germany and others are some of themajor suppliers to Saudi Arabia with weapons which include drones, bombs, torpedoes, rockets and missiles. Moreover, soldiers from several countries such as Colombia and Sudan have been recruited by some of the members of the Saudi-led coalition in Yemen war. Seemingly, the continuation of the war is of a great interest as many are benefiting from the war. Next week marks the sixth anniversary of Yemen’s 2011 uprising. Many will take the opportunity to reflect on the merits and the failures of the uprising, and that will inevitably will be through an eye tainted by the ongoing war. For me, I reflect and try to understand how did we get here today. German political theorist, Hannah Arendt once said, “revolutions are the only political events which confront us directly and inevitably with the problem of beginning”, and that is what the uprising anniversary should do – confront us with the problem of beginning. *This essay was originally written for and published in German newspaper woz.ch earlier this month.